So…..here is a look at what I was up to this weekend! The quilt along actually started a while ago, but we are gonna catch up! Some of you guys might already be following Amy’s blog or the virtual quilting bee, so you can help us out. She uses guest bloggers to create the blocks. So you get to check out some cool blogs too! The blocks are 8″ finished size, 16 in total. 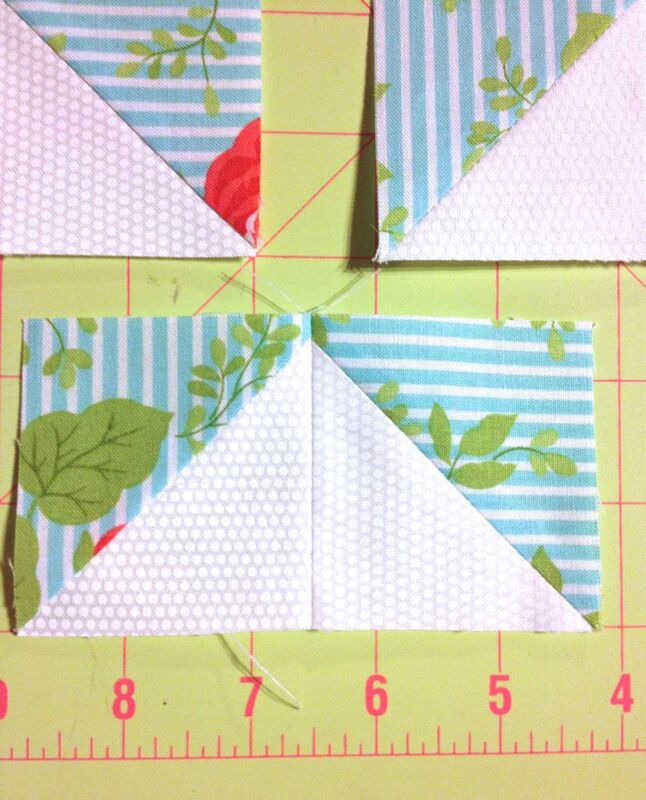 The virtual quilting bee is giving two examples of each block. One using the fabric line, Happy-go-lucky by Bonnie and Camille and another option with Kona solids. I just so happened to have a Happy-go-lucky FQ bundle so that is what I am using, but I am sure you could use any line. Maybe even go scrappy! I will post my progress every Friday and show you my block. For all the beginners, I will let you know if anything is super tricky or needs a “sassy” breakdown:) For the Pro’s out there, I would love to just see what your blocks are looking like. Once we catch up, we will just follow her schedule. I think it will be exciting and I hope you guys will follow along:) It will only be one block at a time, so it shouldn’t be too overwhelming and the blocks look super cute and fun! To check out The Virtual Quilting Bee, click on the badge or picture above! This will help you catch up on all the posts to prep you for the quilt along and show you all the finished blocks so far. I have never done a quilt along before, so if you haven’t either…Let’s do it! a quilting bee sounds like a lot of fun! That sounds like a good idea. Will hope on over to Amy`s blog and check it out! I’ve been participating in one of those recently. So fun to see what everyone is doing! I was all gung-ho to do Amy’s virtual bee, but then it kinda didn’t happen. Too much other stuff going on, but it is good to know there are others getting a late start, so maybe I will still join in! Thanks for linking up with Let’s Get Acquainted today! Ok Paula, I’ll play catch up with you!! I’ve never made a sampler quilt before and right now I feel like I could do with some random block piecing practice :D I think i’ll be fun to play catch up together – how many blocks have you got done so far, do i need to get motoring?! I’m in. I’ve never done this before…but I’ll try to stay with you as soon as I get my fabric. I looked at the blocks on Flickr, and many of them are very stunning with rich contract color pallets.